Each gutter cleaning is completed using a back pack leaf blower to clear debris from all gutters and downspouts. Our crews use a rope and harness as well as specialized roofing boots (designed for gripping asphalt shingles) for the safety of our employees as well as to prevent damage to roofs.Every gutter cleaning service includes a 3 month clog free guarantee and a free roof and gutter inspection. Why should you clean your gutters and downspouts? If the gutters are full and the downspouts are clogged they will be unable to function properly. Water will overflow and may cause damage to the building surfaces, landscaping, and to the gutter system itself. 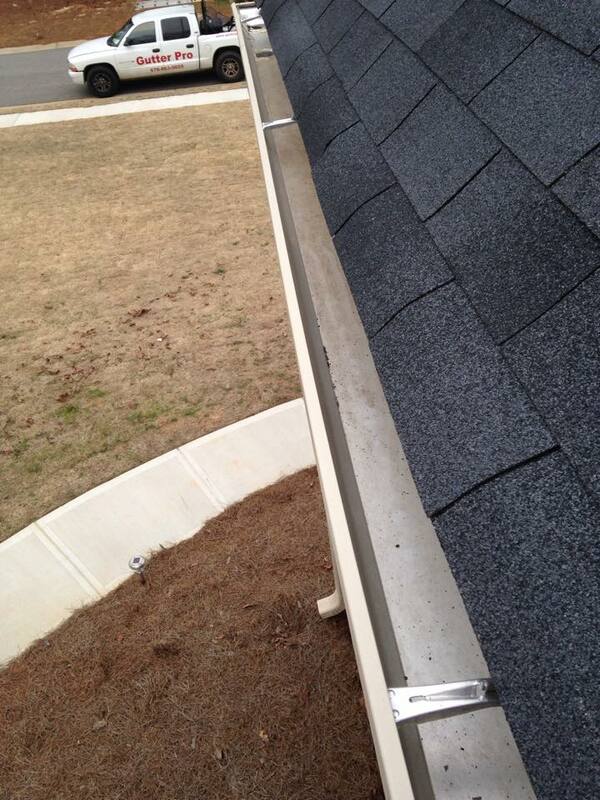 The weight from the gutter can cause it to pull away and eventually fall off. Over time some gutters can become so clogged with organic muck and debris that small trees will grow in the gutter. Ignoring the task can cause numerous problems such as rotted fascia boards, water damage to the walls and siding, roofs, and foundations. These problems can be very expensive in the long run. Call Gutter Pro TODAY to prevent these expensive problems later. GutterPro is fully insured and able to handle any job, no matter how big or small.